In a case from the Northern District of California, a federal judge ruled that a patent owner could not maintain a patent infringement action against a company that was making products for the patent owner’s licensee. In 2012, Asetek, a Danish company, entered a licensing agreement with Corsair in which Corsair was permitted to practice Asetek’s patents in exchange for royalty payments and other consideration. 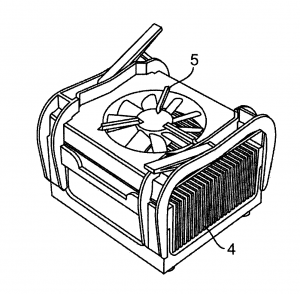 The patents at issue involved liquid cooling systems for computers. Asetek grants Corsair . . . a non-transferable, non-assignable, nonexclusive license, with no right to sublicense, under the US Patents, to make, have made, use import, sell, offer to sell (through distribution or otherwise), or otherwise dispose of Licensed Products in the United States. CoolIT made allegedly infringing products for Corsair pursuant to Corsair’s request. Initially, these were just standard CoolIT products with Corsair’s logo added to the outside cover. However, by the time Corsair and Asetek entered into their patent license agreement, Corsair was giving CoolIT new product specifications for the products it was manufacturing for Corsair. Asetek sued CoolIT for patent infringement. CoolIT moved for summary judgment on the grounds that it was making the products under Corsair’s “have made” rights. Asetek contended that the “have made” rights did not apply where a licensee simply purchased a product “off the shelf” in ready-made form. [I]t is difficult to discern a policy basis to distinguish under the implied license theory a customized product from a standardized product purchased by the licensee. In either case, the licensee chooses to outsource the production in order to practice the patent rather than manufacture the product itself. And even if the product is off-the-shelf, immunity extends only to sales of the product to the licensee, not to sales by the manufacturer or by any other unlicensed party. It is therefore difficult to discern how the licensor’s expectations and rights are impaired as a result of the licensee buying off-the-shelf versus customized products; the licensor’s rights as to sales of infringing off-the-shelf products to unlicensed users is still protected. Furthermore, the line between customized and non-customized products can be unclear: for instance how should the court treat an off-the-shelf product that is slightly modified for the license? The court also found that even if it accepted Asetek’s argument that “off-the-shelf” products were not covered by a “have made” license, no reasonable jury could conclude that CoolIT’s products were actually sold to Corsair in ready-made form and not custom made. Corsair agrees that neither Corsair nor its Controlled Companies will use the licenses and rights granted by Asetek under this Agreement in any way to circumvent the purpose of this Agreement, or the licensing and enforcement of the US Patents and Non-US Patents against unlicensed entities. Corsair agrees that neither Corsair nor its Controlled Companies will use the licenses and rights granted under this Agreement to launder products of unlicensed entities. The court found that the laundering provision did not trump the “have made” rights and was not applicable to the facts of the case. It is not clear from the decision why Asetek would grant Corsair “have made” rights and then sue Corsair’s supplier for allowing Corsair to make use of those rights. It is possible that including “have made” rights was simply a careless mistake that didn’t reflect Asetek’s actual intent in granting the license. It might also be that Asetek, which claims to be the world’s leading provider of liquid cooling systems for computers, didn’t anticipate that the “making” would be done by CoolIT – its leading competitor in the liquid cooling field. The lesson here for patent licensors is that if you care about who does the “making” under a “have made” clause you should specify that in the license – and exclude your competitors. Asetek isn’t giving up after its summary judgment loss. Shortly after being issued a new patent on June 10, it sued CoolIT for infringement of the new patent – one that presumably is not yet the subject of a license to Corsair.